Don’t Replace Your Carpet. Let Carpet Chemist Repair it! Home • Blog • Don’t Replace Your Carpet. Let Carpet Chemist Repair it! “Repair carpet? I didn’t even know you could do that!” We hear this all the time. Lots of people do a google search and find us, in a last-ditch effort to see if anyone out there can repair their pet damaged carpet, before they end up spending hundreds or even thousands on carpet replacement. We’ve seen it all. People who use their carpeted flooring as an ironing board, hookah burns, bleach spills, carpeted areas in the doorway that are shredded because Fido tried digging his way out, you name it. Berber carpet snags are a common occurrence, especially in households with pets. Dogs and cats easily get their claws caught in this loop pile carpet and pull the yarn loose. When gone unnoticed, these snags will get sucked up into the vacuum cleaner and create a run in the Berber carpet. If you have ever had Berber carpet in your home, chances are you know exactly what I’m talking about. The best thing to do is leave the Berber carpet snag alone and call The Carpet Chemist. We are experts at repairing Berber carpet snags and perform hundreds of these types of carpet repairs every year. Pet damaged carpet is generally caused by pets trying to dig their way out of a room where the door is closed. An example of this is the home owner is getting ready for work, Snowball is hiding under the bed, and Mom or Dad close the bedroom door and Snowball is stuck in the bedroom all day with no food or water. Instinctively, she claws up the carpet at the doorway in an attempt to escape, leaving your carpet in shambles. If you live in a rental home or apartment, The Carpet Chemist can save you from having your deposit revoked due to torn carpet. Selling your home or moving into a new one? When you have carpet buckling or ripples throughout the home, it can be a real turn off to prospective buyers. The Carpet Chemist can help you with your loose carpet issues. The most common reason for wrinkled carpet is poor installation. Most carpet installers use a knee kicker to install entire rooms of carpet. This is a tool that was made to stretch corners, closets, and other tight spaces. It is however, improper. To properly install or re-stretch carpet, you must use a power stretcher. This is a tool that extends the entire length of the room and makes your carpet drum tight. If your carpet installer shows up to install your carpet with a knee kicker, chances are you’ll be calling us to re-stretch it in just a few weeks or months. Our sole purpose is to save you money. 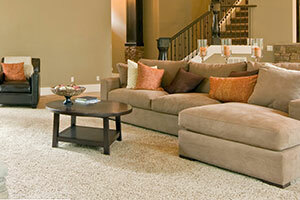 Before you consider tossing your carpet into a landfill, give The Carpet Chemist a call. We have lots of raving reviews on our Facebook page and on Google, from customers who were overjoyed that we were able to save their carpet, so they wouldn’t have to spend thousands of dollars on replacement.